PackRite conveyors are designed to move bags to enhance the productivity of weighing, filling, sealing, packing and other related production operations. Our metal conveyors are sturdy and durable, helping keep maintenance to a minimum. Adjustable speed, feed direction, length, and height from floor allow customization to your exact operational needs. All of our conveyors have neoprene food-grade, water resistant belting that will carry light to heavy loads without slipping. 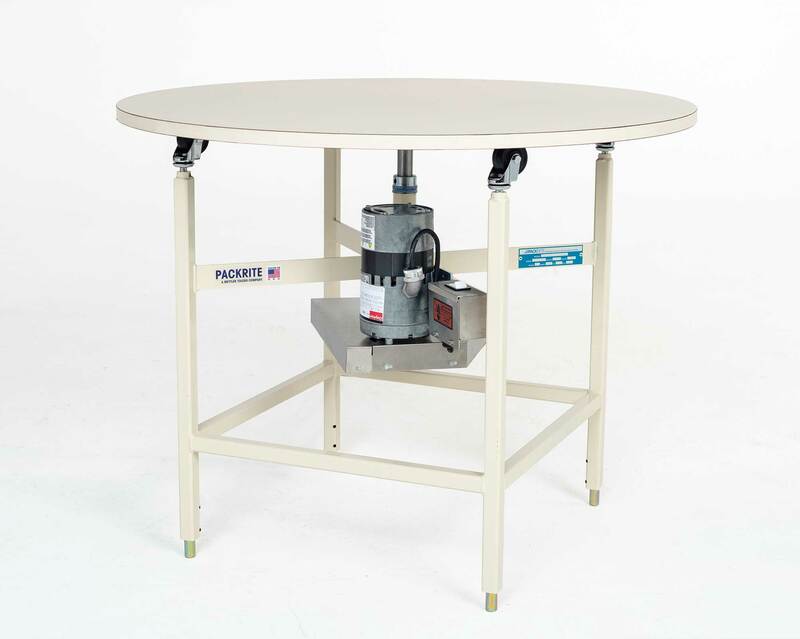 The PackRite Rotary Accumulating Table collects the overflow from a packaging production line to keep your operation running smoothly. It rotates three complete turns per minute, and allows personnel the necessary “time out” for packing without stopping the production. The Rotary Accumulating Table’s stable, continuous rotation is ideal for collecting bags, cartons, boxes, tubes, and other packing materials. Height is adjustable, so it fits right in with other packaging production line equipment. Formica Tabletop Diameter (Standard) 48 in. Height from Floor (Adjustable) 28 to 41 in. Continuous ammeter test shows no motor overload with distributed loads up to 500 lbs.